It all started when I turned 18 and set out on my own as a musician. Having rubbed elbows with once famous, very old entertainers in my very first job out of high school, (bussing tables at the only NIGHT CLUB in Warren, Michigan ~ The Golden Coach), I was advised by many of the old school entertainers that my last name did not quite roll off the tounge. That if I was going to dive into the entertainment world, I should do so with "A Stage" name. It didn't seem to be an issue with Englebert Humperdink, or that Limonjello guy...just sayin'. You have heard the term CLASSIC ROCK. You have heard the term Alternative (fill in the genre here). People seem to like putting musicians in a box of some sort. Then there are artists like myself who were birthed in one time period, but are still trying to thrive and create and entertain in another one seemingly light years away. Okay so I am a few decades older than when I started back in the late 60's. Yeah I have been draggin my feet for a little too long now. Well, the time has come to step back in front of the stage lights and sing you a little tune... I am back on the music scene. The Lord hath provided me with several gigs to follow up my CD release and all I did was mention it to Him! 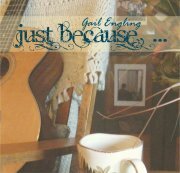 We have finally sent my new CD~ ‘JUST BECAUSE…’ out for print. The prospected release date is April 10th , 2012. It will be available for purchase thru my website http://www.singingundergrace.com , or at any of my Live performances. This CD is a 15 song eclectic compilation of some of the music I perform at my concert and music venues. Now I don't claim to be a writer..heck I just had to make sure I spelled WRITER right, because it just doesn't look right. I am not even sure what I will be BLOGGING about (to use the correct vernacular). I was however, told..."Just do it. Make it a priority and do it often." Who will care? I am assured if I write it they will read. They may not respond but they will read. Who are THEY anyway? Here starts an out of the box journey into the unknown ~ Gail's Blog.